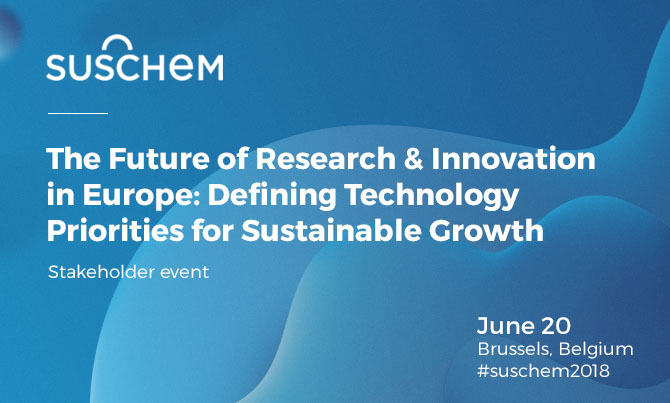 The SusChem stakeholder event is the leading annual meeting held by the European Technology Platform for Sustainable Chemistry (SusChem). This year’s theme is «The Future of Research & Innovation in Europe: Defining Technology Priorities for Sustainable Growth». Our annual stakeholder events bring together global audiences, senior players from the chemical industry, academia, research technology organisations (RTOs) and EU institutions to address common innovation challenges and debate priorities crucial to the sustainability of the European chemical and biotechnology sectors. With the European Commission (EC) communication on the Multiannual Financial Framework (MFF) released in May and the overall structure of Horizon Europe, this year’s stakeholder event is happening at a critical moment in the policy cycle. This presents a significant opportunity for stakeholders to voice their priorities and help define SusChem’s input into Horizon Europe. We have planned an exciting programme to give you multiple opportunities to voice your expectations and priorities for Horizon Europe and help shape the next SusChem Strategic Research and Innovation Agenda (SIRA). Stakeholder input is essential to determine the game changing technologies, such as Key Enabling Technologies (KETs), that will boost European competitiveness as well as have large-scale impact at a societal level, and feed into potential Horizon Europe missions.